Sometimes the pen really is mightier than the sword. In Cornelia Funke’s Inkheart this statement comes true as the book takes you on a magical journey into the world of fantasy. Mortimer (a bookbinder) uses his amazing power of speech to magically read two villains and a street performer into the real world. The villains names were Capricorn and Basta and the street performer was referred to as Dustfinger. Mortimer is so busy ushering the villains out of the house that he doesn’t realize that his wife has dissapeared until after he comforts Meggie. Eight years later, late at night,they hear a knock on their door, it is Dustfinger. He suggests that the family should move away from their home in fear that Capricorn will attempt to exact revenge on Mortimer. I loved the ending because it was surprising and at the same time very satisfying. At times the book can be kind of dull but if you stick with it, you will be entranced by the magical characters the author uses in the story. If I had a chance to read the book again I am sure it would be a much more enjoyable experience for me because the first time through I was slightly confused about the plot. 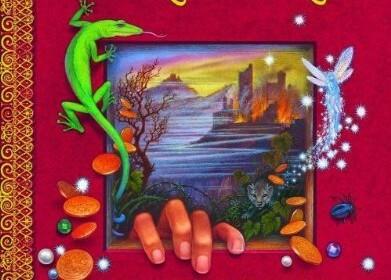 I would recommend this book to anybody that loves a good fantasy story and to anyone who loves descriptive language. Age-wise, this book would be appropriate for ages 11 and up because it has language that some kids would not understand. Overall, the the plot of Inkheart was well worth the time of reading the book .